1. 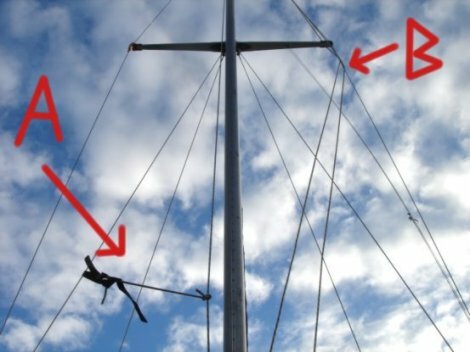 How do i stop banging ropes and wires in the mast? - A Option A is best suited for the roler furling, it is not always easy to give slack to this rope so you might have to tie it up even though there is tension on it. My tip is make it simple, Kiss. Keep it simple Stupid. Tie it up with whatever you have, a bungee rope is great but will wear away fast in the tropics so i would not sacrifice it. Tie it up with whatever but be sure to do it tight, especially if youer mast is long. 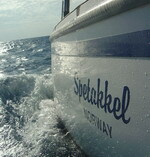 - B This is for the main sail. A super trick that it took me years to learn. It is dead easy but someone has to tell you about it and then you have to try and fail a little. Slack the ropes going up and the one coming down. 'Sling' the rope on the forward side of the mast back around the spreader and the rope on the stern side around to the front of the spreader then carefully tighten the tension on your winch without letting the ropes getting freed up there. When tightened they will be so far away from the mast that they will not bang.